In this day and age, it can be hard to find someone that is kind to everyone they meet. People are caught up in their own world, and they often forget that many people struggle to get through the day by themselves - especially in an upper middle class town like Canfield. Junior contributor Jillian Mt. Castle is the epitome of an extrovert. 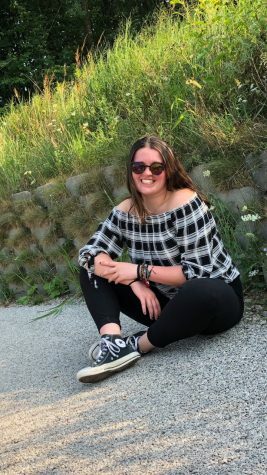 Between working at the Austinwoods Nursing Center, working with the special needs kids at school, participating in track, and spending time with family and friends, Jillian is constantly surrounding herself with people. “Anything I’m doing I’d rather be doing with someone else. Someone else to talk to or someone else to do something with,” Mt. Castle says. Every Sunday, she arrives at Austinwoods bright and early to take the breakfast order of 200 residents. Mt. Castle is a ray of sunshine for many at the nursing home, and always tries to talk and make their day better. “It’s nice to be the little light in their life because sometimes their families don’t visit them at all… I try to just talk to them a little bit because you might be the only person they get to talk to today other than the nurses,” she says. While a nursing home is often a much better standard of living for residents than living alone, it can get lonely. Jillian spends eight hours every Sunday taking orders, preparing and serving food, or just simply talking to residents. This small sacrifice makes all the difference to them. Both in the nursing home and out, Jillian is constantly bringing a smile to the face of everyone she meets.